• Rep. Jaime Herrera Beutler had the lowest re-elect number out of all of the red Congressional Districts in Washington on Tuesday. • 50.3% of voters chose a Democrat. • 59% of voters cast their ballots for someone other than Herrera Beutler. Looking closer at successive ballot counts from the first, Jaime Herrera Beutler has been ahead in each district wide count, actually increasing her lead each count. 64.07% voted for someone other than Carolyn Long. Just how Ms. Long’s campaign can send out a campaign email claiming “It’s clear: Southwest Washington is done with Jaime,” and keep a straight face is beyond me. In fact, looking at individual counties that comprise the 3rd Congressional District, only in Clark County did Ms. Long end up with a slight lead, 39.53% for Ms. Long compared to 38.95% for Herrera Beutler, a difference of about one half of one percent, separated by a scant 574 votes. To be clear, there is a small but vocal fringe alt-right element in Clark County that wants Herrera Beutler turned out, but the candidate they fronted finished well down with only 5.5% of the vote. So just where do they figure Southwest Washington is done with Jaime when Carolyn is trailing district wide every single ballot count? And why doesn’t the Lazy C see this as “newsworthy” as much as they do a Republican candidate for County Council trailing by 60% against an incumbent Republican whining about ill treatment at the party booth in the County Fair? Surely a candidate issuing such a bogus claim as “It’s clear: Southwest Washington is done with Jaime” when that candidate is actually trailing in ballot counts should merit some mention by the paper. But no, they only expend ink to shed light on Republicans. As for Carolyn Long, she just might pull it out and win come November, stranger things have happened. But issuing bogus claims when the facts say the opposite won’t get her there. Don’t count your chickens before they hatch, Ms. Long. It’s going to take more than such blatant fabrications. I sent this letter to the editor this morning. We’ll see if it gets printed or not. “I take issue with Greg Jayne saying Jaime Herrera Beutler’s main policy “is a losing one.” I watched the debate between Long and Jaime Herrera Beutler posted by the Columbian. 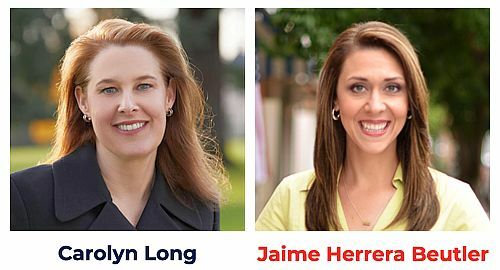 While Long plus the editorial board went after Herrera Beutler, Jaime admirably defended her vote to cut taxes by $2,300 per family and stimulate economic activity that we haven’t seen in decades. And “main policy?” If Jayne were honest, he would also focus on Jaime’s work against tolling that unfairly impacts Vancouver residents, predation on the Columbia river, and working to make sure healthcare is affordable. Mr. Jayne may like the government managing your money more than you do, but he shouldn’t ignore Jaime’s focus on helping Southwest Washington in many ways. It’s been apparent to me from the beginning that the Lazy C is in the tank for Long. They proved they’re in the tank for the left with that ridiculous editorial today. Now they’re even letting them dictate content! And how soon they forget their years of condemnation, ridicule and smears of Fox News. Obama saying Fox News held a “destructive viewpoint” is excused and tolerated.